"Can you identify the pink and little brown balls growing now on our oak tree? I don't remember seeing these before. Yep, it's oak gall season in California! Galls are interesting creations of several varieties of (usually harmless) wasps. No action is necessary on your part, except to enjoy the show. The Integrated Pest Management Project at UC Davis says this about galls: "Most galls are caused by cynipid wasps and gall midge flies. The adult gall wasp is a small, stout, shiny insect with very few wing veins and a purple or black body. Adult gall midges are tiny, delicate flies, often with long, slender antennae. Galls are distorted, sometimes colorful swellings in plant tissue caused by the secretions of certain plant-feeding insects and mites. These unusual growths may be found on leaves, flowers, twigs, or branches. Most galls are not known to harm trees. Prune and dispose of galls if they are annoying. This may provide control of some species if pruning is done when the immature ones are in plant tissue and before the adults begin to emerge." "Your picture of a blue oak tree have several types of oak galls made by several species of small, non-stinging wasps in the wasp family "Cynipidae". As an entomologist, we refer to the members of this family as "cynipid wasps". They are unique among the wasps in that they lay their eggs on plant tissue resulting in a distinctive plant gall encasing the egg/larva. Each cynipid wasp species make different and distinctive galls and one can identify them based on the gall type. Obviously, your blue oak sample had several types of galls and therefore several species of wasps. There is not much you can do to control these gall wasps. They are native species that co-evolved with the blue oaks in the area. The wasps are not killing the trees and they also don't appear to weaken them; so, my recommendation is to just let them be." "1) The most obvious are the "echinid galls" produced by the wasp "Dryophanta echina". These galls vary from pink to bright red and have the spiny galls. 2) The second gall that you asked for was for the small brown galls that look like little brown balls? These are probably "jumping oak galls" caused by the wasp "Neuroterus saltatorius." Lynn in Chico writes: "Yesterday I noticed my sidewalk was dancing, sort of. Looking closer I saw what looked like bird seed scattered, but the seeds were jumping! I collected a few of the tiny eggs (?) and they are still jumping this morning. They can get about a half inch of air when they jump. I assume they are some sort of bug getting ready to hatch. Most of them are on the ground under the oaks on my property. Please let me know if they are good bugs or bad bugs." "If you have a Valley oak tree growing in your landscape, or if you visit one of our local parks where Valley oak trees are growing, you may notice a strange phenomenon occurring this year. The ground beneath many Valley oaks this year is covered with pinhead-sized yellow or brown seedlike objects, most of which are hopping around. The tiny things are called "jumping oak galls", and are formed by a tiny, dark wasp. The wasp belongs to an interesting family of wasps called the cynipids. "The galls are actually malformations of plant growth. The tiny gall-forming wasp lays an egg in an oak leaf at a precise moment in the treeís growth cycle, causing normal plant cells to multiply at an unusually high rate. As a result, the tiny egg becomes encased in the gall composed of oak leaf tissue. "When the egg hatches, the gall provides both food and a living chamber for the larvae. In summer, the oak gall drops to the ground with the tiny wasp larvae inside. The insect moves in jerks, causing the entire gall to jump around on the ground. Itís believed that the larvae hop around in an attempt to find a crack in the soil to hide up in. At maturity it transforms into a pupae, and later into an adult which chews its way out of the gall. The wasps themselves are dark colored, so tiny that youíll probably never see them, and harmless to people. "A few insect-formed plant galls are found on willow, poplar, rose and other plants, but more than 100 different kinds are found on oaks. The entire oak tree is fair game for the cynipid wasps, which form wasps on leaves, buds, twigs, branches, roots and even the acorns. Each cynipid wasp species forms a gall of particular size, shape and color; no other species forms one quite like it. Also, each one lays its eggs in a specific plant part. "Besides the jumping oak gall, you be familiar with the common oak apple, a large gall up to three inches in diameter. These large galls are common on the deciduous Valley oaks, and contain one or more tiny cynipid wasp larva inside. 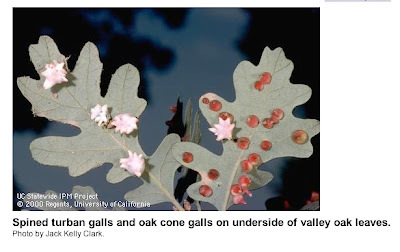 You may also find a pink, star shaped gall on the undersides of Valley and blue oaks. Other galls are cone shaped, or round and fuzzy, or shaped like tiny loaves of bread. 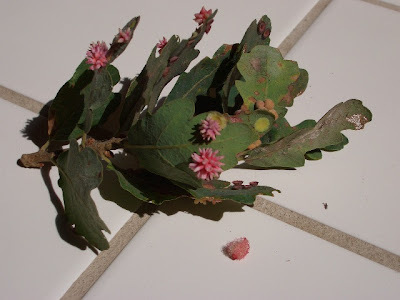 "In California, most insect caused galls are not harmful to the plant. In some cases the galls may damage leaves or even cause twigs to die. However, the insect galls cause no serious permanent injury. Because of their complex life cycle, it is very difficult to prevent cynipid wasps from forming galls; in most cases, it is unnecessary to do so." While searching for the few remaining pluots in the garden last night, a familiar loud buzz zoomed by my ear. You may be hearing that same ferocious buzzing as you are picking the backyard tomatoes, figs, peaches, pluots, corn and berries these days. 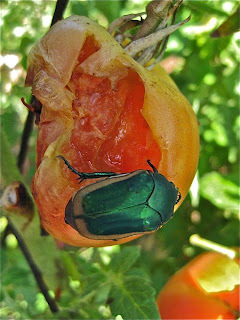 You just might be disturbing the eating habits of the green fruit beetle (Cotinis mutabilis), munching away at the overripe and damaged fruits and vegetables in your garden. It's not just the sound that will stop you in your tracks. The combination of the biplane-like buzz as well as the sight of these slow flying, large (an inch and a quarter long), metallic green-shelled creatures might make you drop your crops. Sacramento County Farm Advisor Chuck Ingels has noted an increased number of calls about this species of beetle (also known as the fig beetle) from concerned gardeners, especially in southern Sacramento County. But its march up the state is continuing. 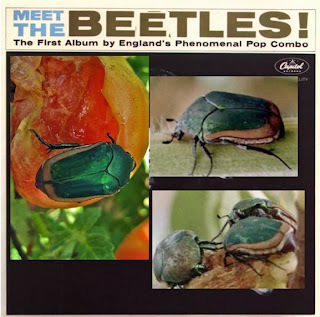 Retired State entomologist Baldo Villegas says the presence of green fruit beetles in our area has increased dramatically in the last 15 years. Until the late 1990's, they had only migrated as far north as Fresno. "This beetle is now widespread from Mexico to the southwest and into northern California," says Villegas. "They are migrating northward fast." Villegas explains that the beetle is more vexing for backyard gardeners than commercial growers. "I consider them a nuisance pest," says Villegas. "They feed on rotting or open fruit and are attracted to them by the gas emitted by the fruit." A native of Mexico, Villegas recalls the green fruit beetle as a harbinger of summer. "We used to catch them on fruit damaged by birds or in rotting fruit laying around on the ground," says Villegas. "We would tie a piece of string on one of their hind legs and that would allow them to fly along side of us." Unlike a balloon on a string that escapes your grasp, the green fruit beetle is not going to drift away, high into the sky. Right now, those beetles are laying their eggs in your piles of garden compost, manure and mulch. The best control is to remove any such piles from the areas where you have seen the feeding adults. Turning the piles frequently will expose the larval stage of these beetles, a C-shaped, creamy white grub. Hand picking or flooding the area for two days can limit these noisy munchers during the next gardening season. In addition, chickens consider those grubs a delicacy. To limit the spread of the adult beetles now, take away their food supply: fruit that is getting too soft on the vine. Trapping might be somewhat successful, according to former UC Davis Integrated Pest Management Director Mary Louise Flint. In her excellent book, "Pests of the Garden and Small Farm," she says that the green fruit beetle can be attracted to a half-filled, one-gallon jar, containing a 50-50 mix of peach or grape juice and water. Make a funnel out of small mesh wire and place it in the jar's opening. This will allow the beetles to get inside, but not back out. 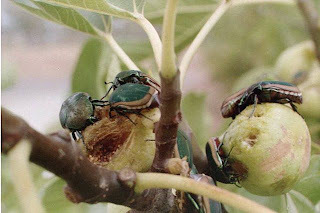 Insecticides are not recommended against the adult green fruit beetle. 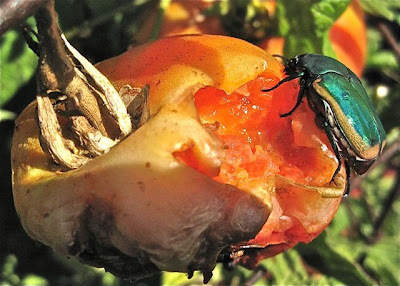 The UC Davis Integrated Pest Management website offers these tips for green fruit beetle control: "Early harvest and removal of fallen fruit can reduce damage. 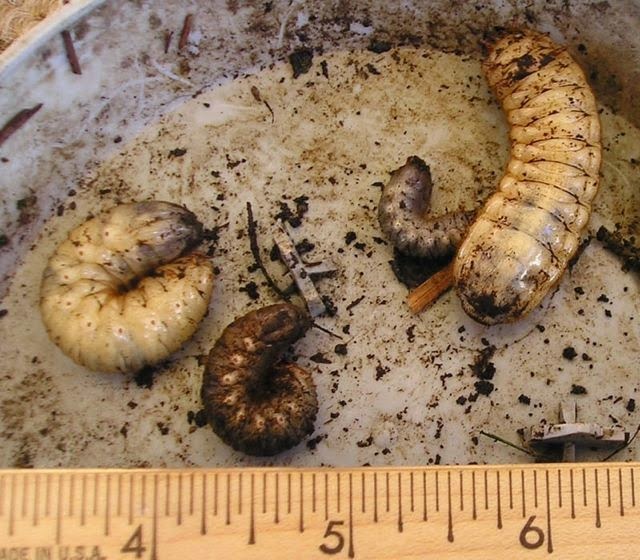 To manage grubs, remove all manure, lawn clippings, or leaf piles from areas near fruit trees and turn compost piles frequently to speed decomposition and expose small grubs." And if the buzzing is too loud? Another good argument for plugging in the headphones and not having to listen to these beetles while gardening.